It is with great sadness that I must pass on the news from Kerry, that his Grandfather, Peter Carrie, Flight Engineer with Bernard Lukin’s crew passed away early this morning at the age of 102. 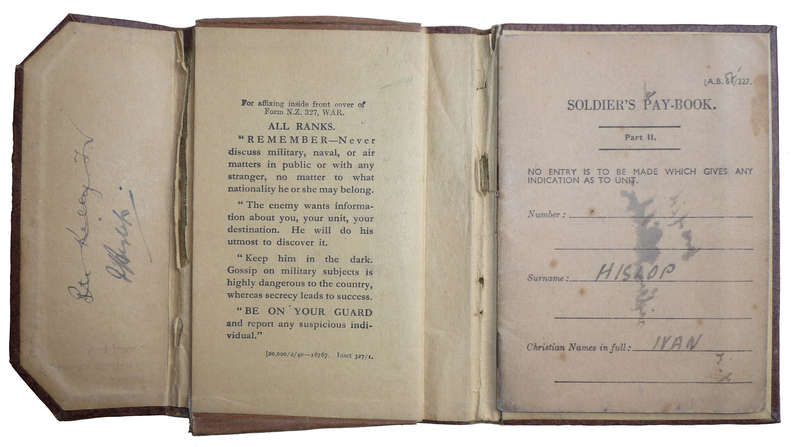 Peter’s remarkable story has been featured more than once in the blog over the last few years – so remarkable in fact, as to warrant its reproduction now as a tribute to Peter and his time during the War. Peter Carrie who flew with Bernard Lukins crew as Flight Engineer between February and July 1945. If the stories of the boys who flew in the Squadron are all not remarkable, then Peter’s is even more so. Born 1915 in Dundee, Scotland, he joined the Army at 19 in the Tank Corp and served in India and the Khyber Pass. During WW2 he was evacuated from Dunkirk , they found him covered in dead bodies and thought he only had hours to live – in Kerry’s words, he was like a ‘pin cushion’ with shrapnel wounds all over his body. The King sent a letter to his parents when he made it to a military hospital informing them of his condition. The Army found him unfit for service so Peter joined the RAF and ended up with Bernard Lukin’s crew at Mepal in February 1945. See the Lukin’s crew Op history here. Often when I state superlatives I add, ‘as far as I am aware’ – in this case I don’t have to. 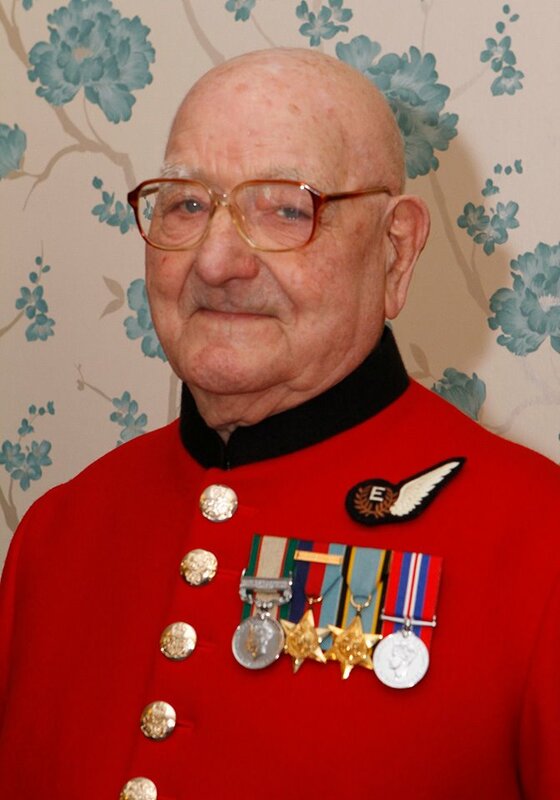 Peter was the only Chelsea Pensioner to also hold the Bomber Command clasp. 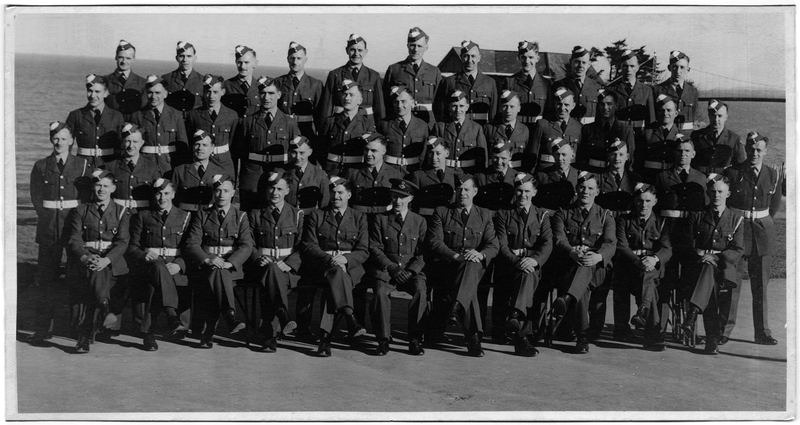 A group photograph taken during Peter’s training to become a Flight Engineer. Peter is second row from the back, 4th from left. Presentation of Bomber Command Clasp to Peter Carrie by General Sir Redmond Watt, KCB KCVO CBE DL on the 23rd of April 2014. “We are here today to mark a significant event in the life of In-Pensioner Peter Carrie. Peter has the distinction of having served with both the Army from 1934 – 1940 and the RAF from 1943 – 1946. After much public pressure to recognise those who bravely set out from bases all along the east coast across France and Germany on perilous missions, the Bomber Command clasp was finally instituted in 2013. To that end, Peter is the only Chelsea Pensioner to qualify for such an award. Peter was as a Flight Engineer on many Lancaster bombing missions,including those on Hamburg and Wesel. 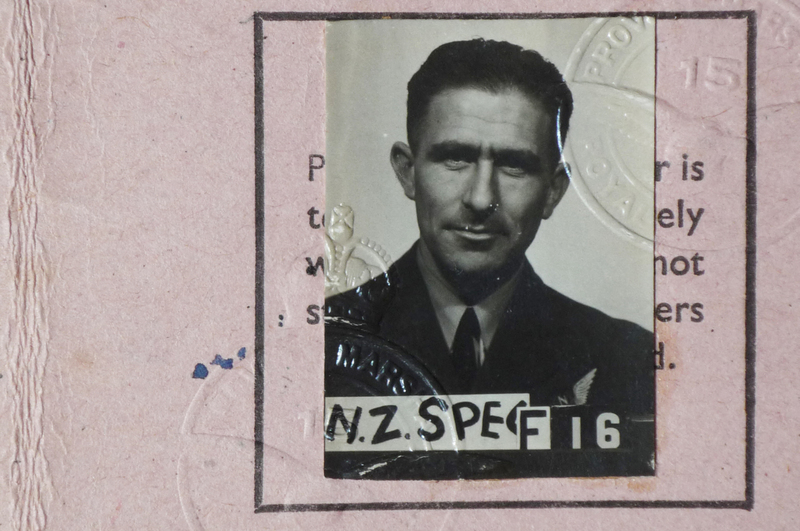 He served with 75 (NZ) Squadron, which was constantly engaged against Germany from 1940 to VE day. According to statistics, this squadron flew more sorties than any other Allied heavy bomber squadron. It suffered the second highest casualties of all the Allied squadrons, and dropped the second largest weight of bombs of any Allied squadron.Miraculously Peter and his crew members made it safely home following each mission, although on many occasions his aircraft was hit by enemy flack and even lost the occasional engine. Some 55,000 Airmen who served with Bomber Command were killed during wartime raids and Peter can testify to losing many friends and colleagues on these daring missions. He will be the first to say that he was no hero and saw his brave feats as just part of his job, however his modesty belies a man of integrity and immense courage in the face of such danger”. I am sure you would all wish to join me in passing heart felt condolences to Kerry and Peter’s surviving family at this sad time. Another of these incredible old men has left us. This entry was posted in general and tagged 1945, 75(NZ) Squadron RAF, A. Crossfield, Aviation, Bernard Lincoln Lukins, Bomber Command, Bomber Command Clasp, Brussels, Chelsea Pensioner, Delft, Duncan Ross, Dunkirk, F. Gunningham, Hague, Juvincourt, Mepal, Operation Exodus, Operation Manna, Peter Carrie, Royal Hospital Chelsea, Tank Corp, Thomas Benson, William Reid, World War 2 on December 29, 2017 by 75nzsquadron. Albeit, a little belatedly, I would personally and I am sure all of you would, like to wish Peter Carrie the warmest wishes on his birthday today, having reached the magnificent age of 100 years old. Peter has featured in a few of posts already, firstly recounting his amazing story, starting in the Army, before joining the RAF and 75(NZ) Squadron and flying with Bernard Lukin’s crew, a Flight Engineer. We then had news of him receiving a new Flight Engineers brevet to go with his Bomber Command clasp from Air Marshal Sir Stephen Hillier, Deputy Chief of Defence for Military Capability. Finally there was also a small additional post on the Lukins crew, after by chance, we discovered the christian names of 2 more of the boys who flew with Peter. Peters amazing story can be read here. The story of Peter receiving his new Flight Engineers Brevet can be read here. And the discovery of two more of the boys names from the Lukin’s crew can be read here. This entry was posted in general and tagged 18th February 2015, 1945, 75(NZ) Squadron RAF, A. Crossfield, Aviation, Bernard Lincoln Lukins, Bomber Command, Bomber Command Clasp, Brussels, Chelsea Pensioner, Delft, Duncan Ross, Dunkirk, F. Gunningham, Hague, Juvincourt, Mepal, Operation Exodus, Operation Manna, Peter Carrie, Peter Carrie Chelsea Pensioner 100 today, Royal Hospital Chelsea, Tank Corp, Thomas Benson, William Reid, World War 2 on February 18, 2015 by 75nzsquadron. Thanks again to Kerry (belatedly) for the contribution of a number of documents of Ivan Hislop, Navigator with Jim Westbrooke’s crew, March to July 1945. 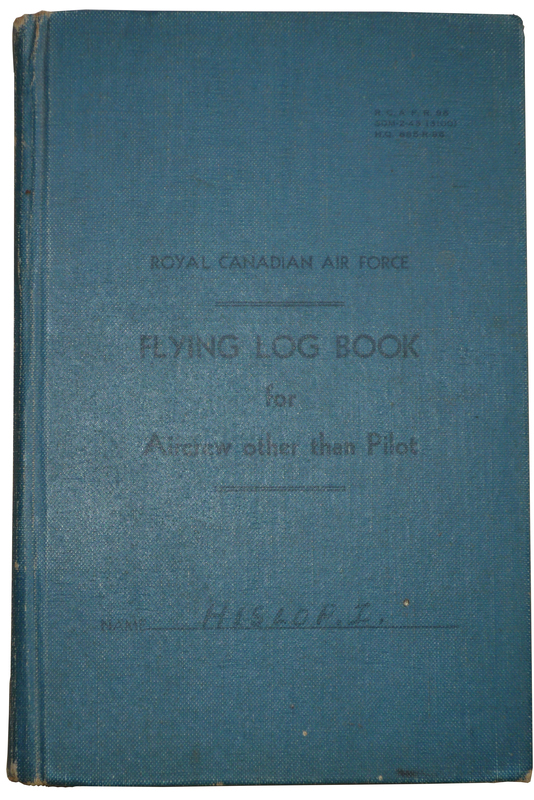 As well as Ivan’s logbook, which can be seen here. Kerry commented when me met in the summer, that what impressed him about these documents was Ivan’s apparent determination to fly. He initially trained as a pilot commencing training with No 2 E.F.T.S. in Ashburton New Zealand on the 8th March 1943, soloing 22nd March 1943. 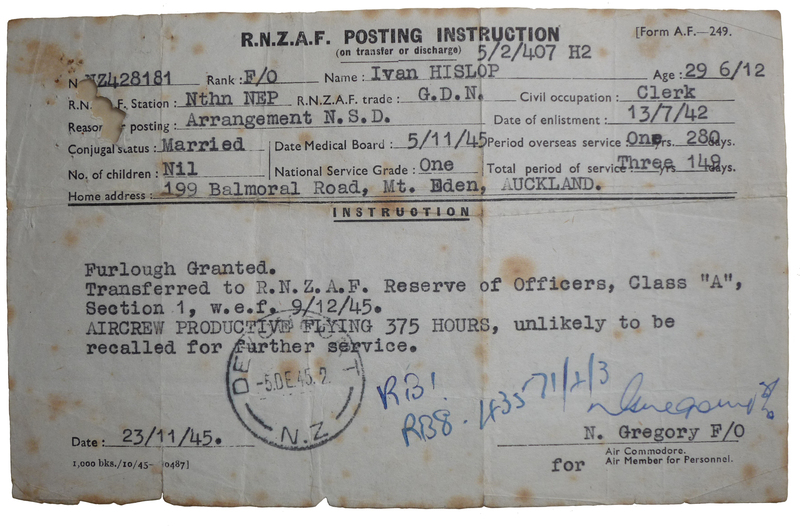 However it appears the training was terminated due to lack of aptitude on 11th April 1943. By the 14th of February 1944 Ivan was receiving navigational training in Canada under the E.A.TS. 2 A.O.S. During further training in the UK he was crewed up with F/Lt James Westbrooke while at 11 O.T.U. Oakley before flying their first & only bombing Op with 75(NZ) Squadron on the 9th April 1945 to Kiel. The Westbrooke crew finished their posting in 75(NZ) Squadron with Manna food drops, Prisoner Repatriation, Post Mortems and Baedecker. 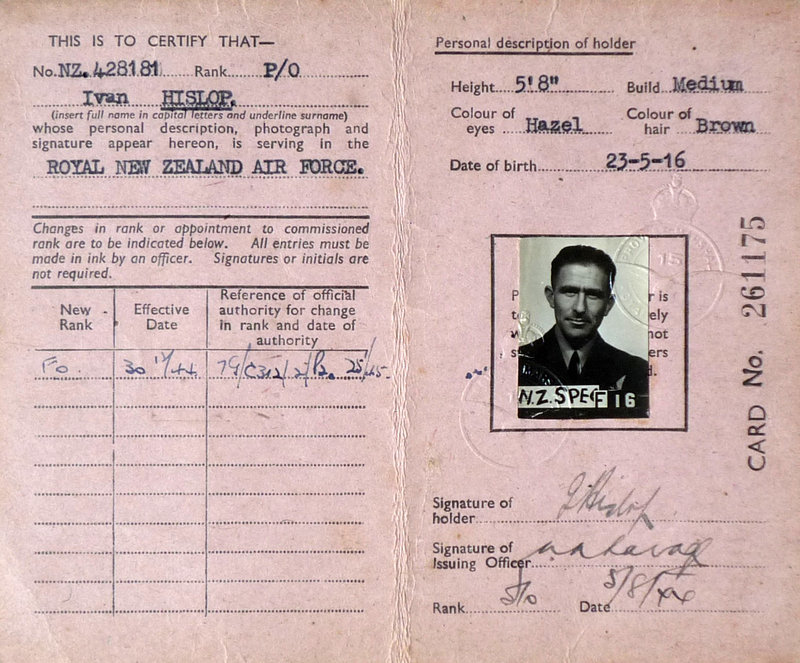 This entry was posted in general and tagged 1945, 75(NZ) Squadron RAF, Ivan Hislop RNZAF NZ428181 Navigator, James Westbrooke, logbook, Mepal, Operation Baedeker, Operation Manna, Prisoner Repatriation on December 26, 2014 by 75nzsquadron. Peter Carrie, Flight Engineer with the Lukin’s crew, now wearing his Flight Engineers Brevet, recently presented to him by Air Marshal Sir Stephen Hillier, Deputy Chief of Defence for Military Capability. All rights recognised for original owner of the photograph. Through being a member of a few RAF related Facebook pages, I came across a new and wonderful story regarding Peter Carrie, Flight Engineer with Bernard Lukin’s crew. If you recall, I was contacted a couple of months ago by Peter’s Grandson, Kerry, with news that Peter had just been award his Bomber Command Clasp – a very notable event as it meant that Peter was the only Chelsea Pensioner to hold the Clasp. I’m really pleased to pass on another award, this time of a Flight Engineers brevet. I think the original post of this story (difficult to track sometimes on Facebook) come from the British Army Facebook page – I hope the original author doesn’t mind me reproducing the picture above, or a small extract from the full piece that can be read here.Chelsea Pensioner Sergeant Peter Carrie, a WWII Army and RAF Bomber Command veteran, has finally added a flight engineer brevet to his distinctive scarlet uniform. Sergeant Carrie, born in Dundee in 1915, has the unique distinction of being the only Chelsea Pensioner eligible to have a Bomber Command Clasp because as well as his army service he served in the Royal Air Force in World War II as a flight engineer on Lancaster bombers. It was only when he received his Clasp in April this year from General Sir Redmond Watt, the Governor of the Royal Hospital Chelsea, that staff realised Sergeant Carrie was ‘improperly dressed’ without his flight engineer brevet, which he was eligible to wear on his uniform along with his medals. This entry was posted in general and tagged 1945, 75(NZ) Squadron RAF, A. Crossfield, Aviation, Bernard Lincoln Lukins, Bomber Command, Bomber Command Clasp, Brussels, Chelsea Pensioner, Delft, Duncan Ross, Dunkirk, F. Gunningham, Flight Engineers Brevet, Hague, Juvincourt, Mepal, Operation Exodus, Operation Manna, Peter Carrie, Royal Hospital Chelsea, Tank Corp, Thomas Benson, William Reid, World War 2 on July 26, 2014 by 75nzsquadron. A little more about the Lukins crew…..
After the very high viewing figures of my post about Chelsea Pensioner Peter Carrie, Flight Engineer with Bernard Lukins crew last weekend, I thought it was making a post about a little more that I have now discovered about them. As with many of the RAF/ RAFVR boys that flew in the Squadron, the RAF’s decision to destroy the Personal Occurrence Records (POR’s) at the end of the War, means that now the Squadron records only list many of them by initial, rather than name – so I am constantly pleased to receive names where they are known. This afternoon, I was contacted by Malcolm, whose Grandfather, James ‘Jimmy’ Shaw, was a Pilot at Mepal between February and June 1945. As well as being able to give me the christian names of all the boys in the crew, Malcolm also sent a small clipping that had originally been posted on a forum, I assume, from Bert Donald, Jimmy’s Wireless Operator. Amazingly, within the paragraph, Bert remarked that he was still in touch with two members of the Lukins crew – Duncan Ross, the Air Bomber and Bill Reid, the Wireless Operator, so Duncan and William, pleased to meet you……. Additionally and I feel awful for missing it, Sgt. 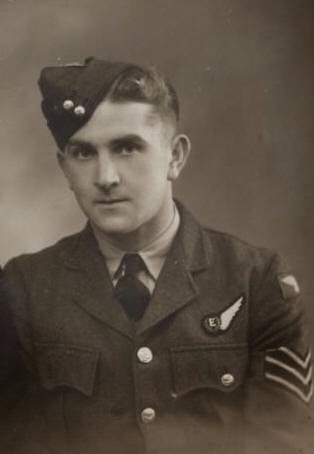 T. Benson, Rear Gunner with the Lukins crew is of course Tom Benson – Brian had previously been in contact about his Father, but in the activities of last weekend, I completely failed to make the connection – but all details are now updated! So, I suppose the message is if you know even only the christian name of a relative who flew with 75(NZ) Squadron and particularly if they were RAF/RAFVR, please get in touch – if they weren’t killed in action, as terrible as that sounds, I apologise, the probability is that we don’t know their names. This entry was posted in general and tagged 1945, 75(NZ) Squadron RAF, A. Crossfield, Aviation, Bernard Lincoln Lukins, Bomber Command, Bomber Command Clasp, Brussels, Chelsea Pensioner, Delft, Duncan Ross, Dunkirk, F. Gunningham, Hague, Juvincourt, Mepal, Operation Exodus, Operation Manna, Peter Carrie, Royal Hospital Chelsea, Tank Corp, Thomas Benson, William Reid, World War 2 on May 10, 2014 by 75nzsquadron. 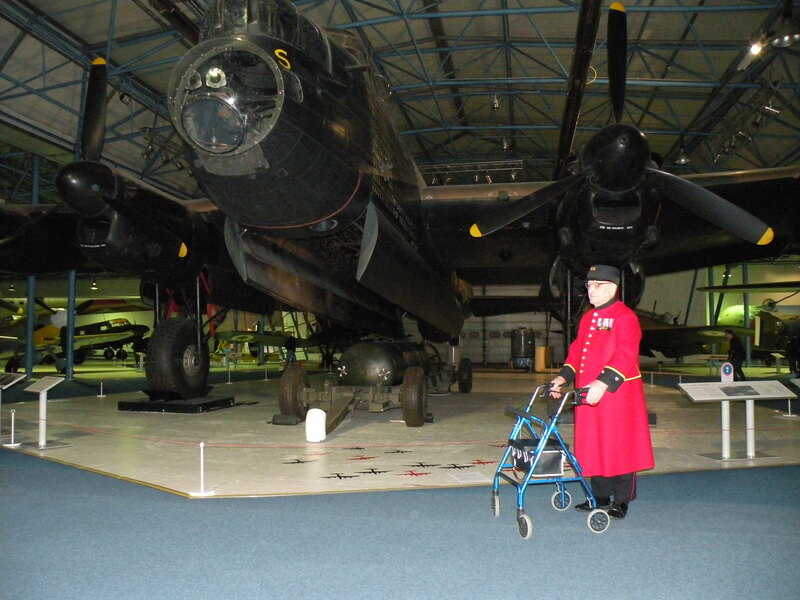 In a remarkable recreation of the above photograph, Peter stands alone under S ‘Sugar’ at the RAF Museum Hendon. © image owner unknown at this date – I have tried to find out and will amend details when able to – but the image is too moving to not include in this post……. Many thanks to Kerry for passing on these images of his Grandfather , Peter Carrie who flew with Bernard Lukins crew as Flight Engineer between February and July 1945. If the stories of the boys who flew in the Squadron are all not remarkable, then Peter’s is even more so. Born 1915 in Dundee, Scotland, he joined the Army at 19 in the Tank Corp and served in India and the Khyber Pass. During WW2 he was evacuated from Dunkirk , they found him covered in dead bodies and thought he only had hours to live – in Kerry’s words, he was like a ‘pin cushion’ with shrapnel wounds all over his body. The King sent a letter to his parents when he made it to a military hospital informing them of his condition. The Army found him unfit for service so Peter joined the RAF and ended up with Bernard Lukin’s crew at Mepal in February 1945. Often when I state superlatives I add, ‘as far as I am aware’ – in this case I don’t have to. 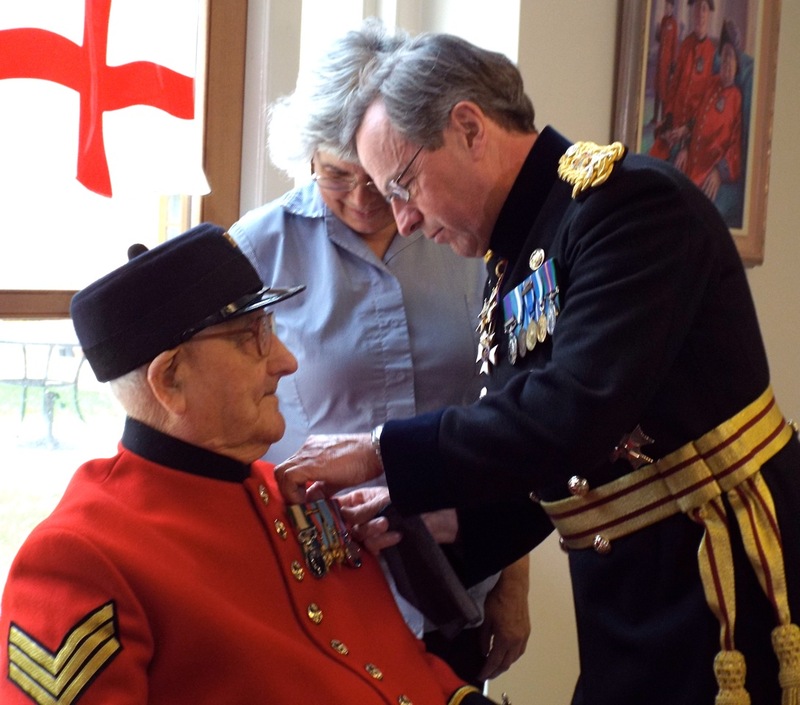 Peter is the only Chelsea Pensioner to hold the Bomber Command clasp. 156733 F/S Lukins B.L. and crew arrived on posting from 1669 C.U. 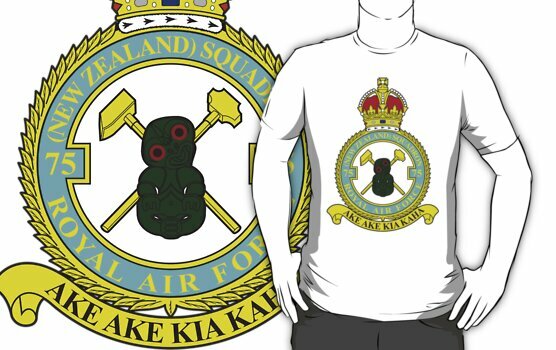 Five days later the Lukins crew would begin their tour with 75(NZ) Squadron RAF. F/O Charlie Green Joins the crew as Mid Under Gunner. RA510, AA-J suffered an engine failure immediately after take-off. The port-inner engine was shut down and feathered then the Lukins crew proceeded to The Wash where the bomb load was jettisoned before returning to base, landing at 15.10hrs. The raid, was not a success as the G-H equipment failed to function correctly and all Squadron aircraft failed to bomb. The main raid was highly destructive, with the Pathfinders marking in clear weather conditions. This was the last RAF raid on Cologne, subsequently captured by American troops four days later. A milestone was reached on the Essen Op, when the largest number of aircraft sent to any target so far in the war, took place with the dispatch of 1,079 aircraft to Essen. 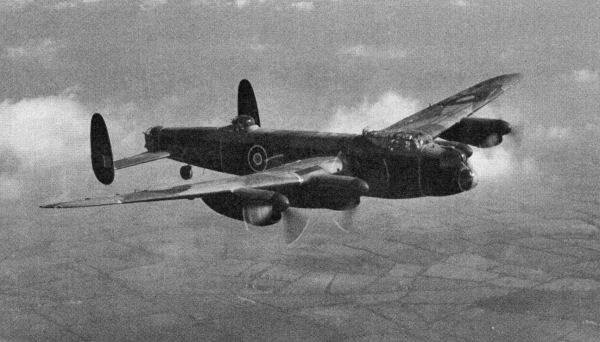 The force comprised 750 Lancasters (21 ex 75 Sqn), 293 Halifaxes and 36 Mosquito’s from all bomber Groups. Only three Lancasters were lost. 4,661 tons of bombs were dropped through complete cloud cover on Oboe-directed sky- markers. It was an accurate attack and the resulting devastation virtually paralysed Essen until American troops entered the city some time later. Following on from the previous day’s record force of 1,079 aircraft to Essen, the area-raid on Dortmund by 1,108 aircraft from all Groups established a new record that would stand till the end of the war. Three aircraft types were again involved; 748 Lancasters, (21 ex 75 Sqn), 292 Halifaxes and 68 Mosquito’s. Two Lancasters were lost. 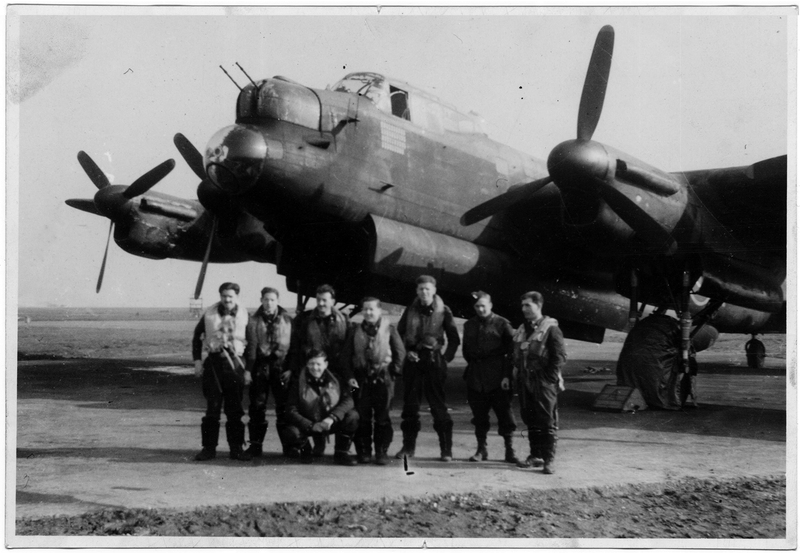 This was the first raid by Bomber Command four-engined aircraft in the Berlin defence zone since March 1944. This time the approach across parts of Germany recently captured by Allied troops led to only one Lancaster being lost – shot down by a night- fighter. It was also the last raid of the war by a major Bomber Command force on a German city. The aiming point was the center of Potsdam and the intention was to destroy the local army barracks, and the railway system. The raid was successful and severe damage was caused not only in Potsdam, but also in northern and eastern districts of Berlin. P/O Lukins & crew, found it unnecessary to drop their smoke-puff. Their bombs were observed bursting on the railway junction south of the A/P and north of the river. A daylight op of 100 Lancasters of 3 Group, including 20 from 75(NZ) Squadron, were detailed to carry out attacks on the fuel- storage depot at Regensburg, on the Danube, 7 miles east of the Czechoslovakia/ German border. It was an accurate raid with only one aircraft lost. This was the last raid in the current campaign against German oil targets, waged since June 1944. Much of Bomber Command’s effort during this period, sometimes at considerable loss, has been devoted to these oil operations helping not only the Allied ground forces on the Western front, but also those fighting in Italy and on the Eastern front. PB418, P/O Lukins & crew, observed their bomb bursts on the A/P (Aiming Point) while in good formation. Then their starboard engine failed. No Mid Upper Gunners flew on this Op. The aircraft detailed for this Op were airborne Mepal at or about 11.20hrs. A total of 50 supply packs were carried – 25 for Delft and 25 for The Hague. Crews had no difficulty identifying the targets at each dropping zone. Of the 10 packs dropped, 4 hung up. The packs contained an undisclosed number of food bags many of which fell free of the packs and burst open on impact. One of these bags contained flour which burst in mid-air. Other bags falling directly on the white cross, broke open scattering the contents. Fewer people than on previous days were now turning up, but they still were enthusiastic in their praise for the aid. At one drop zone, crews noted the field appeared to be guarded by soldiers. In general, all crews reported well-concentrated dropping of supplies taking place. The 10 aircraft returned to base safely on completion of the task, landing between 13.24 – 1359hrs. This was the largest number of 75(NZ) Squadron Lancasters detailed for supply dropping to the starving people of Holland, in this series of humanitarian aid operations. 5 Squadron aircraft were detailed for the evacuation of 336 ex Prisoners of War from Juvincourt to RAF Ford. 15 Lancasters were detailed for the operation in which 360 Prisoners of War were returned home. The total to-date was 1,224. Just two aircraft were made available, not only for the return of Prisoners of War but also for repatriation of Belgian Refugees to Brussels. The aircraft departed from RAF Waterbeach, England with 20 refugees – 10 on each aircraft. After offloading their Belgian passengers at Brussels, each crew then took on board 12 Prisoners of War for the return journey to England. This brought the number of POW’s returned home by the squadron to 2,219. F/L Lukins & crew, had a minor taxiing mishap while at Brussels, damaging the wing. Their planned uplift of 24 ex Prisoners therefore had to be cancelled. That days operation completed 75(NZ) Squadron’s contribution to Operation Exodus. Between 9 May and 26 May 1945, 134 sorties were flown during which 2,354 Ex Prisoners of War were repatriated to England and 152 Belgian refugees to Brussells. This entry was posted in general and tagged 1945, 75(NZ) Squadron RAF, A. Crossfield, Aviation, Bernard Lincoln Lukins, Bomber Command, Bomber Command Clasp, Brussels, Chelsea Pensioner, Delft, Duncan Ross, Dunkirk, F. Gunningham, Hague, Juvincourt, Mepal, Operation Exodus, Operation Manna, Peter Carrie, Royal Hospital Chelsea, Tank Corp, Thomas Benson, William Reid, World War 2 on May 4, 2014 by 75nzsquadron.